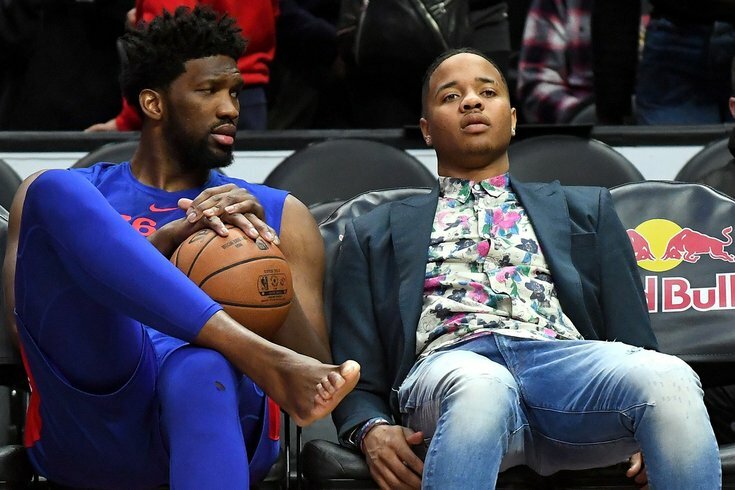 Philadelphia 76ers center Joel Embiid (21) and guard Markelle Fultz (20) talk as they sit courtside before a game against the Los Angeles Clippers at Staples Center. After wading through more pressing topics on Friday afternoon, including Joel Embiid's health, Jimmy Butler's wrist, and the players on the roster who have been a part of their recent successful push, it seemed time to question Brett Brown on Markelle Fultz. Last Saturday, we received our first update on Fultz in over a month and a half, as the second-year guard returned to Philadelphia to rejoin the team and continue his return-to-play program alongside his team. At the time, team sources framed Fultz's return as a positive step, but they insisted that it was one surrounded by uncertainty. They would not commit to him being on the team's West Coast road trip, which begins tomorrow in Denver. Before leaving on Friday, Brown told reporters that Fultz will be on the trip with the team, but it doesn't sound like it means much more other than having him around. "He will be with us on this road trip," said Brown. "He will continue [physical therapy]. And what'll end up happening is I will be instructed — I have not been instructed — of what that actually looks like, if anything, on a court. So it'll continue just with the physical therapy work, which is all that has been shared with me." "If we can get him running around, moving around, shooting around, then we will, but I'm not expecting it. I'm not right now. I hope to be surprised, and I think I'll learn more once I get out there." First things first — it's definitely a positive that Fultz will continue to do whatever work it is he's doing behind-the-scenes while keeping up with his team on the road trip. Prior to Fultz's return, Brown and the Sixers were most excited just to have him back with his teammates, not to play him but to simply have him around the group again. That he can get his PT done without having to stay home or head back out to L.A. is a good thing. Still, Brown's train of thought upon Fultz's return last Saturday was that he wanted to see what kind of shape Fultz was in upon returning. That the coach isn't able to commit to having him, "running around, shooting around" while on the road trip, based on the information he has been given by the various parties involved, doesn't exactly suggest we're anywhere close to a return here. Elsewhere on the Sixers' roster, the Sixers will likely be without a few of their headliners for at least one game, with Joel Embiid having been ruled out for Saturday's game against the Denver Nuggets in order to get him a game of rest. Jimmy Butler has listed by the Sixers as doubtful for the Nuggets game, but that seems charitable given the specialist visit he is making on Friday. With Embiid, the logic appears pretty simple. Getting Embiid a day of rest on Saturday buys him a huge window to recover in the middle of the season, with their next game not coming until next Tuesday in Los Angeles. "When we sort of look at the schedule, there are sort of periods of the schedule you can anticipate with loading issues there being possible candidates to rest somebody," Brown told reporters Friday. "Some of it happens organically, some of it you can pre-plan...it's been a little bit of the fact that he has had some back tightness, and so it's really just a planned rest. It's not entirely a reaction to some of the things that he's gone through." We will all be robbed of a battle between Nikola Jokic and Joel Embiid, which is a real bummer, but in the service of their pursuit of a championship, it's probably the right call. Wilson Chandler will also miss Saturday's game in Denver, having been ruled out with left hamstring tightness. That's the same hamstring the Sixers' forward injured last fall, and so the Sixers presumably don't want to take any chances. After getting good news on a pair of young Sixers players Thursday morning, it only feels right that we got an avalanche of news in the other direction on Friday.